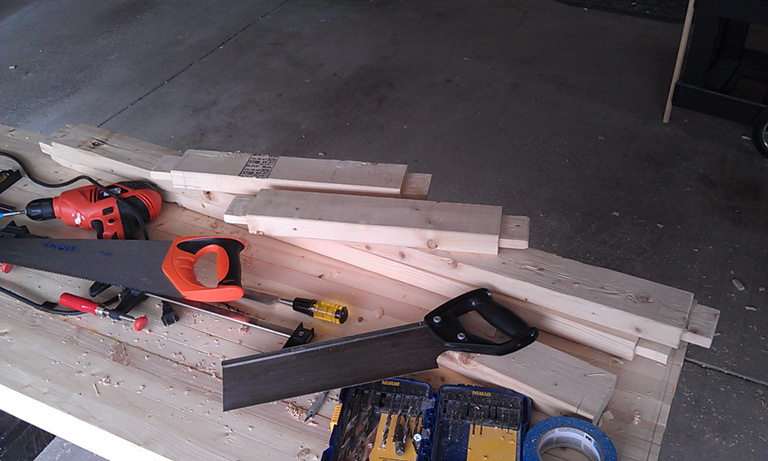 ← Workbench Day 12: More mortises. Workbench Day 13: Dry fit the base! Today was very exciting! I decided to finish the base joinery prep once and for all and powered through the last 3 tenons and mortises. I wrapped up with a dry run of the base and I am very happy with the results (though there are a few minor glitches to take care of tomorrow). 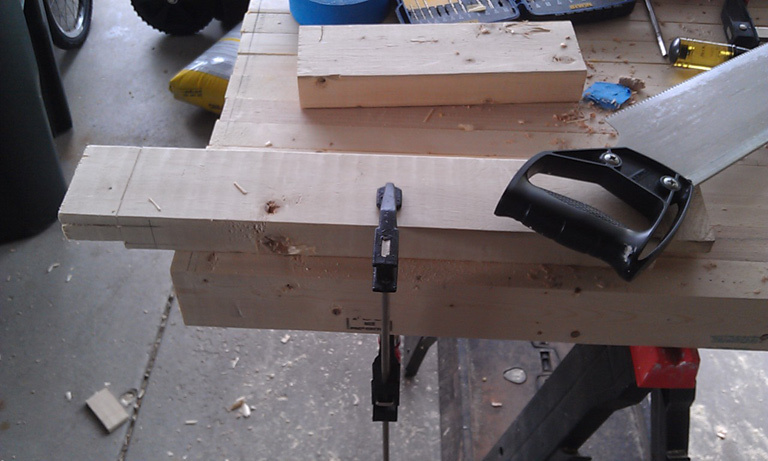 To begin with, I was not at all thrilled with continuing the tenon cutting. I have been using a makeshift saw horse (2 pieces of offcuts from the 4×4 posts stacked on top of each other on the garage floor) to cut all my tenons and it has been a bear (on my back and my knees…that concrete floor is hard!). I hit on the idea of using my workbench top (duh) and clamping the stretchers to it in order to saw the tenons. It wasn’t quite as hard as doing it hunched over or kneeling on the floor, but it wasn’t as easy as having a nice face vise either. Speaking of vises, if you’ve been following along the comments, David asked me about my vise plans (if you haven’t read the comments of previous posts, he’s been supplying me with a steady stream of information, advice and encouragement almost from the beginning and has been invaluable to this project! Thanks man!). I have always liked the looks of a leg vise (yup, the Schwarz converted me pretty quick) but if you’ve been following this blog at all you also know this bad boy is definitely considered budget friendly. Put it another way, the $300 Benchcrafted leg vise (okay, maybe not $300 but it may as well be if it’s over about $10) is just right out. Enter the Lumberjocks projects page. I saw this project by Don Broussard, and knew it was the one for me. While I’m not going to announce I will flat out copy his design, it is going to heavily influence my own. The idea is just genius. I’m still in design phase though, but I should have it wrapped up and ready to start constructing either this weekend or early next week after the base is ready to go (with the exception of the vise, of course). I have the wood. I have the hardware. I have the epoxy. I just need the time. And the design. That might help. Anyway, back to the base. To get to the vise stage, I realized I had to get the tenons and mortises done on this thing. Finally…the last tenon. I think it seems worse than it was to do all these tenons because the work has been spread out over many days…seems like all I’ve been doing lately is cutting tenons! So I went at it and clamped the last few stretchers down, hacked out the tenons (I shouldn’t say that, because these were the best tenons I’ve ever made, but it went so much faster that it felt like I was just hacking the wood off!) and grabbed the Black and Decker Woodwrecker. These mortises simply flew by, because they jut up into the other mortises I already drilled, cut, and chopped out. Before my work-time was up today, I had finished all the tenons and all the mortises. That was good sweaty fun, and the garage smells like pine! Yay! A nice stack of purdy tenons ready for installation. Before them you see the various implements of destruction used today. Right away I noticed why I thought some of the stretchers were twisted (as mentioned in a previous post or two). I didn’t have the silly things seated properly. After getting every joint as tight as they would go, I noticed that the twist was all but gone. I had been worried that my eyeballing the measurements for alignment when I cut the mortises had let me down, but no, my record of near perfection still holds. What I did notice though, was that at every joint the tenons touched and wouldn’t seat properly. There was about 1/8″ gap on the side stretchers from being fully tight in the joint. Turns out I made things a little too tight. So, instead of chopping off 1/8″ from the ends of the short stretchers, I did a little half-lap joint inside the mortises so the short stretchers would sit on and around the edges of the long stretchers (which I would rather have the full length embedded in the mortise…why? I don’t know, just seemed right). I only got one side done today and forgot to take pictures, so tomorrow I will do the other and get some photos to show you exactly what I mean. Once the joints are tight though, things can really get moving. Next up would be prepping the base to receive the top—measuring the final height of the legs, tracing out the mortise points on the underside of the bench top, and cutting…sigh…more tenons and mortises. This entry was posted in Woodworking Skills, Workbench and tagged chisel, dry fit, mortise, Oops, tenon, workbench. Bookmark the permalink. 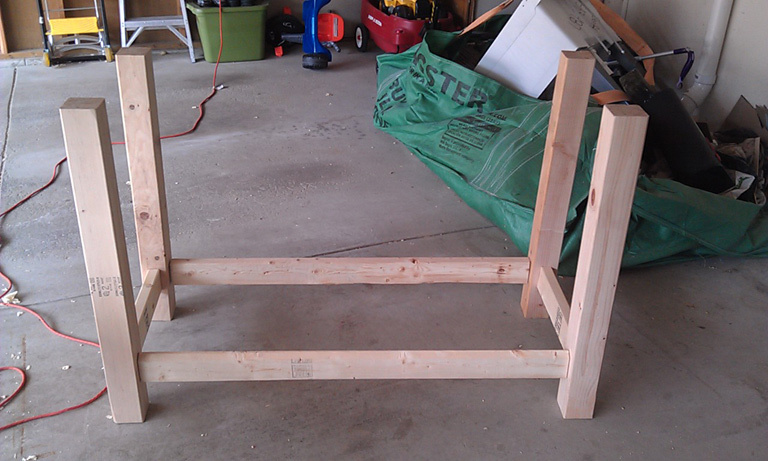 3 Responses to Workbench Day 13: Dry fit the base! Yes. Looks great. The rails from both directions meeting causes a bit of interference. One solution is to offset them. You would have to for through mortises. The downside is that having them meet at different levels makes it really hard to put in a shelf on the bottom. Your way makes that much easier. The approach on many benches is to put another set of rails a bit higher to make a second shelf (and enclose a tool chest between) to add more lateral support. Personally I like the storage in the bench but have never built it that way myself oddly enough. The really nice thing about storage in the bench is it adds mass. A light bench will start walking across the floor. There is another way to go though rather than mortising the top. If you add a rail across the tops of the legs, you can then bolt the top to them from the bottom. That is what I did on my last one. The nice thing is that it is easy to put a new top on if you like or re-purpose it if (when) you build another bench. For the vise, take a look in your local area for some acme threaded rod and nuts. It won’t cost much more than hardware store stuff and it is mechanically superior. It also has a lot coarser thread so you don’t have to crank forever turning it. Another alternative is instead of buying the hardware, spend about the same money for a threadbox and tap (woodcraft.com, woodworker.com). Then you can make a lot of your own clamps and stuff as well. A little more money would get a threading kit from Beall Tool. I have the smaller set and it is really nice. It does cut cleaner than the manual ones but the manual work just fine. Where are you in Wisconsin? Derek (Oldwolf) is in LaCrosse. He might be able to thread and tap a piece for you. Storage is something I have a keen interest in building into this bench in the form of a shelf. My appliances will eventually go there—if I ever build the bench first! I’m hoping with such things as a standard vise strapped to a board and left on the shelf when not in use, a bench hook—stuff like that—there will be enough added weight to keep this thing stable. I won’t really know until I try to use it, but I hope the bench will be heavy enough as it is. Funny you should mention the rail across the top of the legs—that was my original design (I got it from page 86 of Scott Landis’s book, the section on Ian Kirby’s utility bench). I scrapped it when I started this project for what (at the time) I thought was the sexier version presented by Schwarz. Now I have come to realize that the uneven bottom left after I tried to over-complicate the top by using a circular saw instead of a hand plane will be a bit too much to try and be simple. Plus, I’m real nervous about all the weigh of the top concentrated in 4 points of contact with the bottom and no support in between. I mean, sure it’s laminated, but that’s all that will be supporting the whole thing! I think I just feel better knowing there will be a support under the top as well as the legs holding it up. No big deal. Take a look at Mr. Carter’s stuff on LJ and Youtube showing the steps to making a screw. Make your own. Costs nothing but time.